"Adults finding time for colouring-in books might seem a modern fad, part of the fashion for all things mindful. But the trend actually dates back more than 400 years, and one of the earliest books intended for amateur colouring – a series of maps adorned with delicately drawn images of nymphs, water sprites and fairies – is republished, centuries after it was first printed." "Drayton's Poly-Olbion has the most delightful title in English poetry, by a long way. It's hardly ever read these days, which is a pity because it's full of curious quirks and oddities, and a lovely sense that the landscape of Albion (or Britain) is full of gods, nymphs, fairies, and other denizens of fantasy, and that the rivers, hills, and other geographical features he lists so carefully are themselves alive, with memories, speech, and feelings. I welcome the reappearance, in any form, of this vivid and slightly crazy poem, and the picturesque images that accompanied it." "Avery has produced a modern edition of what has been called 'the world’s first colouring book'– Drayton’s Poly-Olbion. And colouring in wasn’t a low-brow hobby for stressed nine-to-fivers – it was a 'noble pursuit of aristocrats who saw it as a creative and mind-improving activity. 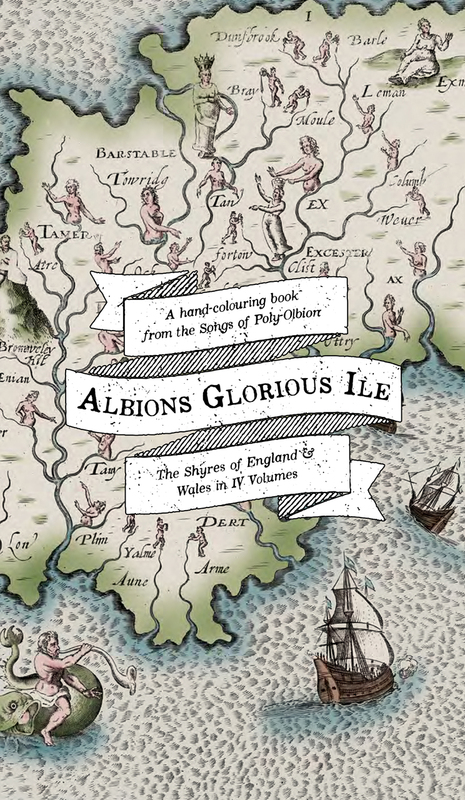 The new book is based on maps drawn by engraver William Hole to accompany Michael Drayton’s huge 17th century guide to England and Wales. They show an extraordinary land that’s more like a fantasy adventure than a guide, with nymphs, kings, giants and dragons....Together they provide one of the most detailed overviews of the rich landscape, history, and legends of Early Modern England and Wales." "The surreal maps – full of monsters and myth–were created by engraver William Hole. His maps, printed uncoloured, give human characteristics to the landscape. Hills become country gents, forests turn huntress. Rivers gods and water nymphs abound."